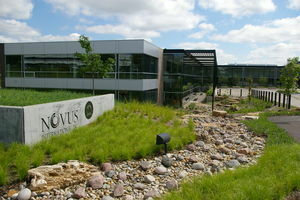 NNP St. Louis, in assoication with SWT Design and Bohn's Farm and Greenhouses, has appreciated the opportunity to assist with plant selection review and establishment for the Novus International landscape, a Sustainable SITES Initiative Pilot Project located in Weldon Spring, Missouri. As a network of independent sales associates, we will serve as a direct link in the distribution of nursery and greenhouse products, providing sales and marketing services to our suppliers and a stable, quality supply source to our customers. We will influence positive change with quality standards, new products, merchandising aids, efficient communication and delivery systems. We will conduct our business with integrity, honesty and professionalism as we strive to reach our supplier's goals and fill our customer's needs. We recognize commitment, loyalty, shared goals, long-term partnerships and fiscal responsibility in those with whom we do business.